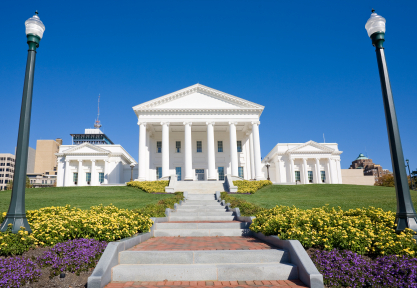 This session is over for the Virginia General Assembly as of Friday February 25, 2011. Let’s see how they did with the companion animal law bills. Below is a description of each bill, the grade I gave the bill in my previous post, and where each bill stands. All in all, I have to warn you that this session was dismal. HB 1541 (patron: Robert D. Orrick, Sr.)/SB 1026 (patron: Phillip P. Puckett), addressing care of agricultural animals and penalty for failure to provide care. This is the bill that provides such minimum standards of care for agricultural animals that it actually threatens to carve agricultural animals out of the current animal cruelty standards under Virginia Code Section 3.2-6570. Grade: F. Result: This bill passed in the House by a vote of 98-0. The Senate added some language regarding seizure and impoundment procedures, and that amendment was accepted by the House. The Senate’s version of this bill had language clarifying that animal cruelty under Section 3.2-6570 was still on the table for agricultural animals, but the House rejected the Senate’s version, and that language did not make its way into the final bill. Big step backwards for Virginia here. UPDATE (5/21/11): Take a look at this post on this statute’s implementation. This gives me comfort, but there is still a long way to go to protect Virginia’s agricultural animals. HB 1556 (patron: Tony Wilt), which would allow training of dogs to hunt bears to occur at night. Grade: F. Result: This bill passed in the House by a vote of 89-7, but has been passed by indefinitely in the Senate’s Agriculture, Conservation and Natural Resources Committee. Nice job, Senate! HB 1716 (patron: James M. Scott, Ward L. Armstrong and Charniele L. Herring), allowing a court to include in a protective order provisions prohibiting harm to a companion animal and damage to any item of personal property. Grade: A. Result: This bill got kicked around last year, and fortunately came back up again this session. The House decided to incorporate this bill with HB 2063. The latest language of HB 2063 does not specifically list companion animals, but it did add the italicized language for a protective orders involving domestic abuse, stating a court may: “Prohibit acts of family abuse or criminal offenses that result in injury to person or property.” For non-domestic protective orders, similar language was added: “Prohibiting acts of violence, acts of sexual battery, or acts of stalking in violation of § 18.2-60.3 force, or threat or criminal offenses resulting in injury to person or property.” This puts petitioners in the position of arguing their companion animals are property. Better than nothing? I’m not so sure. HB 1889 (patron: Tony Wilt), allowing the use of tracking dogs to find wounded or dead bear or deer. Grade: F. Result: This bill passed resoundingly in the House, and finally passed in the Senate, too. The final language changed a bit, but the amendment was nothing substantive. This law still gets a huge thumbs down in my opinion. HB 1930 (patron: Daniel W. Marshall, III), establishing a statewide animal abuser registry. Grade: A+. Result: This bill never got past the House Committee for Courts of Justice. Virginia missed out on being the first state to set up a statewide animal abuser registry. Very disappointing. HB 2108 (patron: Ward L. Armstrong)/SB 842 (patron: J. Chapman Petersen), which would allow circuit Courts to appoint new humane investigators. Grade: A. Result: This bill was already kicked around last year. Not surprisingly, the House version is stuck yet again in the House Agricultural, Chesapeake and Natural Resources Committee. The Senate version has been passed by indefinitely in the Senate Agriculture, Conservation and Natural Resources Committee. HB 2134 (patron: William K. Barlow), providing that law enforcement K9s would not need to be quarantined unless the K9 was showing active signs of rabies or was suspected of having rabies. Grade: B. Result: Yet another bill that will languish in the House Agricultural, Chesapeake and Natural Resources Committee. HB 2195 (patron: Patrick Hope and Robin Abbott), prohibiting devocalization of a cat or dog unless necessary for health reasons. Grade: A+. Result: Another bill left to sit in the House Committee for Courts of Justice. Another missed opportunity here. HB 2312 (patron: Richard P. Bell and Robin Abbott), which would redefine “home based rescue” and add reporting requirements. Grade: F. Result: The House has allowed this bill to sit in the Agriculture, Chesapeake and Natural Resources Committee. So the House got one thing right with companion animals this session. HB 2482 (patron: R. Lee Ware, Jr.), which would provide new procedures for the impoundment, seizure, return or forfeiture of animals when the owner or custodian is suspected of animal welfare violations. Grade: F. Result: This bill has also gotten stuck in the House Agricultural, Chesapeake and Natural Resources Committee. OK, make that two things the House got right. Categories: Pet Owners, Pounds, Animal Control Officers and Law Enforcement, Rescues and Shelters | Tags: agricultural animals, animal abuser registry, animal rights, criminal law, devocalization, legislation, owner responsibility | Permalink. I would like it if this site would publish all the animal related bills that are brought up for discussion in the General Assembly session so we could write our legislators about them. I believe we need to have such a disclosure so we can begin to work up our pro and cons on these issues. We need to get active before the bills end up on the Governor’s desk. I like the presentation and format used and hope my request will be honored next year. Thanks very much, Richard! I will watch out for the animal related bills early next year and get posting in time for people to contact their legislators in a timely fashion. Also, as the year goes by, there are some bills I’d like to target before November to encourage some positive changes — the dangerous dog bill, for one! I would like to see a level below “dangerous” dog focusing on owner responsibility and giving a mechanism to work off the “dangerous” label with the right kind of training, behavior modification and owner responsibility.